There’s been a fight among staff here at CBC. We’ve been hoarding a trove of signed and inscribed material. Some of us want to hold on until the end of the year for our forthcoming “Extra Ink” catalogue. Some of us don’t want to make our customers wait. Since we’re poor pugilists, we’ve compromised. We’ll reserve roughly 40 signed or inscribed items for the catalogue. But, over the coming months we will give you a sneak peek at some of these hoarded treasures in our blog posts. 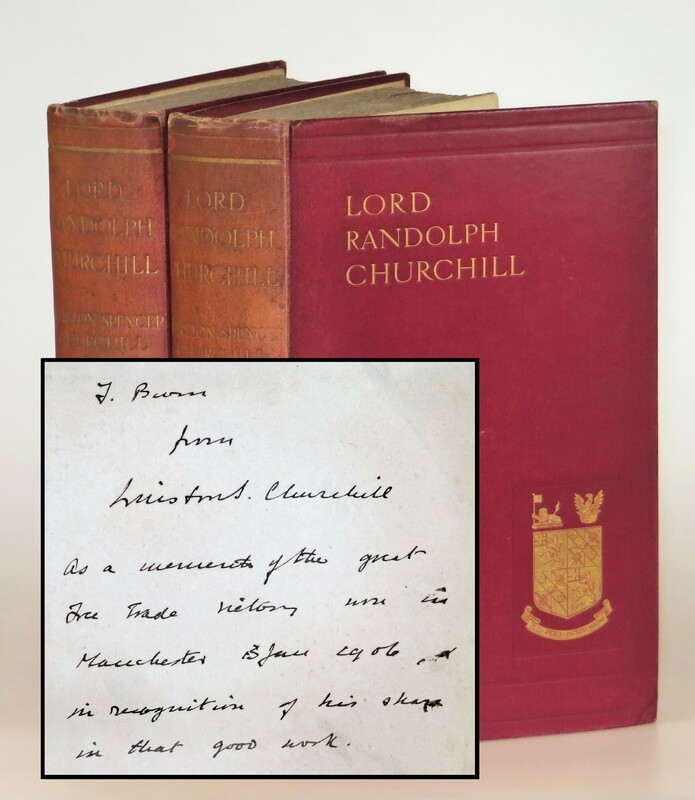 Today, we start early – 13 January 1906 to be precise – with a first edition presentation set of Lord Randolph Churchill inscribed to the man who guided Churchill’s successful first campaign as a Liberal. 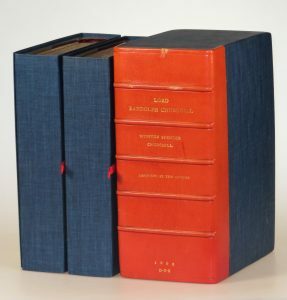 The recipient, Fred Burn (1860-1930) signed the Volume II front free endpaper and further inked “Fred Burn | from the author” on the blank recto preceding the half title. 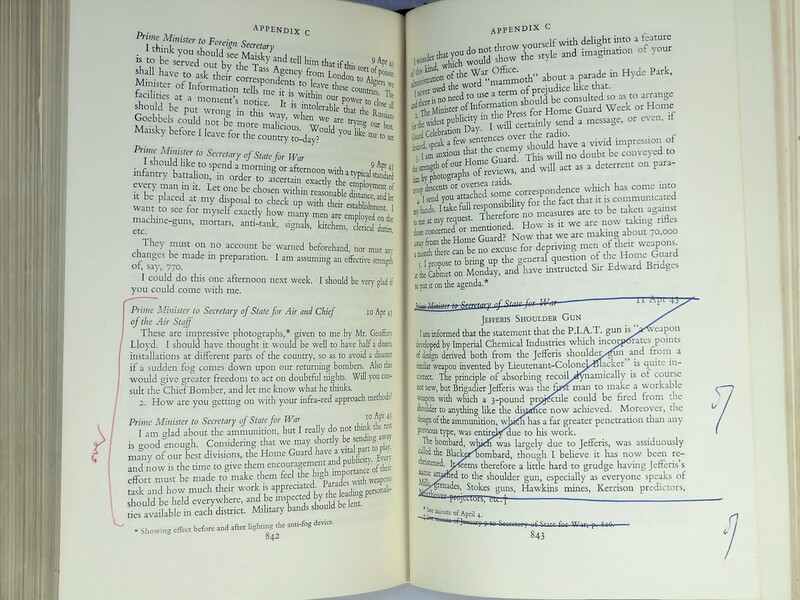 The set’s virtue resides in testifying to the associations and machinations of Churchill’s early Parliamentary career. The volumes have aesthetic flaws endemic to the edition, but are nonetheless unrestored and sound. 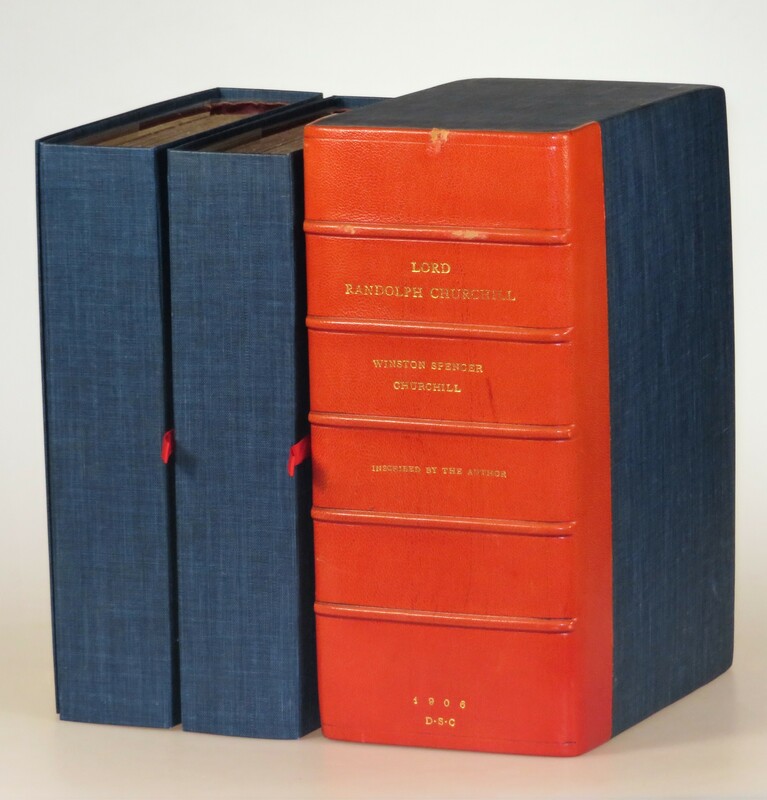 Each volume is housed in a blue cloth chemise nested within a custom quarter leather slipcase. You probably have not heard of Fred Burn for a reason; he was the kind of behind-the-scenes political figure who pins the hinges of electoral power but remains substantially out of the limelight and out of the history books. Burn was a particularly influential figure in Manchester Liberal politics. 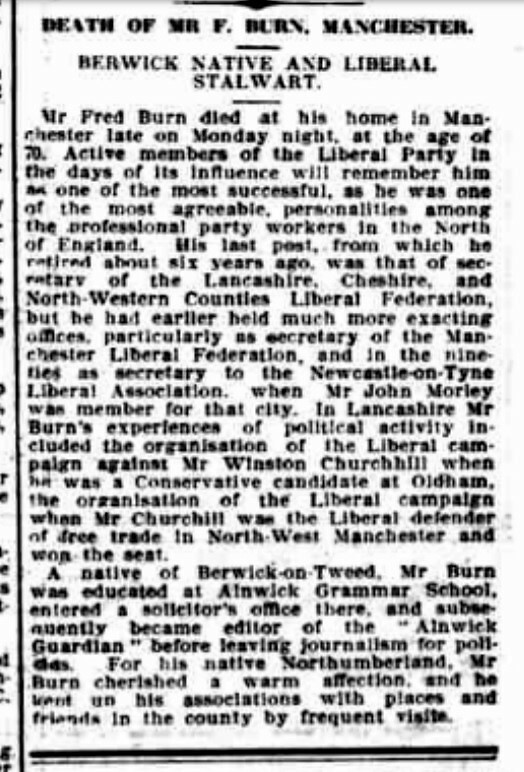 His obituary remembered him as “one of the most successful, as he was one of the most agreeable, personalities among the professional party workers in the North of England.” If anything, it is possible that his obituary understated Burn’s influence. “Mr. 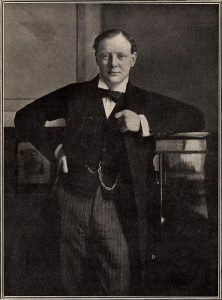 Burn’s experience of political activity included the organization of the Liberal campaign against Mr. Winston Churchill when he was Conservative candidate at Oldham.” Churchill lost the July 1899 Oldham by-election – his first attempt at Parliament. Half a decade later, Churchill turned for help to the very same, shrewd Liberal party fixer who had thwarted him. 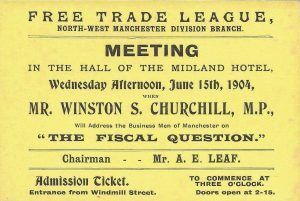 In 1903, The Manchester Liberal Federation (M.L.F.) “wanted ‘a superior man’”. 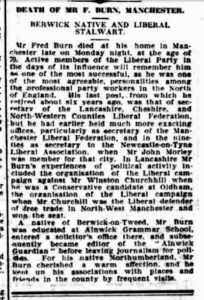 Burn was named Secretary of the Manchester Liberal Federation (MLF) and immediately “under him the staff was re-organised.” His £500 salary was “at the top end of the scale”, reflecting both his efficacy and the importance of his constituency. Burn would more than earn his salary. A 24 March 1904 publication of the MLF lamented the death of the Liberal candidate for North-West Manchester and noted that “it is hoped that in the immediate future another name be put before the North-West Division. That name was one familiar to Burn – Winston Churchill. 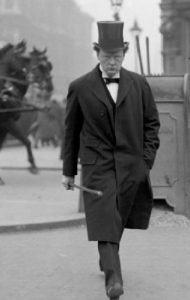 On 31 May 1904 Churchill left his father’s Conservative Party, crossing the aisle to become a Liberal, beginning a dynamic chapter in his political career that saw him champion progressive causes and branded a traitor to his class. On 2 January 1906 Churchill published his two-volume biography of his father. Immediately thereafter, he campaigned for eight days in North-West Manchester, hoping to win his first election as a Liberal. Burn helped balance the electoral scales in Churchill’s favor, guiding both local party organization and Churchill himself. 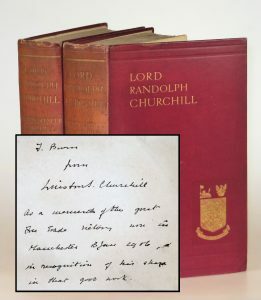 The Churchill Archives Centre houses dozens of letters from Burn to Churchill, spanning the weeks before Churchill’s defection from the Conservative Party to the death of Churchill’s mother in 1921. 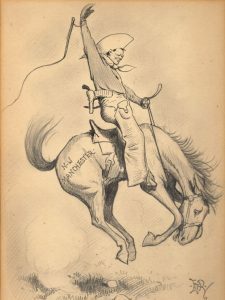 During Churchill’s initial transition to the Liberal Party, Burn was a constant source of information and guidance, some of which was minutely prescriptive. Burn’s counsel was not unsolicited, but rather deliberately sought. Many of Burn’s letters are responses to direct inquiries from Churchill. In a three-page, 15 July 1904 letter, Burn explained the constitution and organization of the Manchester Liberal Federation and how it functioned in relation to Liberal Party politics, including Party organization, political propaganda, and finance. Burn advised Churchill in all three categories in granular detail. Burn was a lynchpin to Churchill’s success. And Churchill’s success was critical to the Liberals. On 13 January 1906 Churchill won the traditionally Conservative seat by a majority of 1,241 in an electorate of 10,000. His fellow Liberal campaigners became beneficiaries. “His efforts in and around Manchester helped six other Liberal candidates to overturn Conservative seats.” His cousin Ivor Guest wrote to him: “You have given the pendulum such a swing as will be felt throughout the whole country.” The Liberals won 377 seats in an electoral landslide. North-West Manchester would prove a brief and fraught interlude in Churchill’s six-decade Parliamentary career, his shortest relationship among the five constituencies he ultimately held. 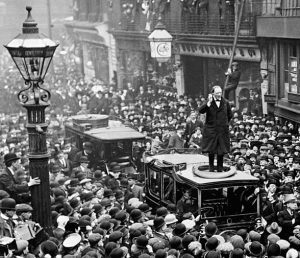 In 1908 when Churchill was appointed to the Cabinet as President of the Board of Trade, custom required that he submit to re-election. His by-election became a test of confidence in the Liberal government. Forced to defend the Government’s policies, targeted by vengeful Conservatives, and hounded on the hustings by Suffragettes, Churchill was narrowly defeated by the Conservative candidate. Nonetheless, the 13 January 1906 election and Churchill’s brief time as M.P. for North-West Manchester made all things possible for him. 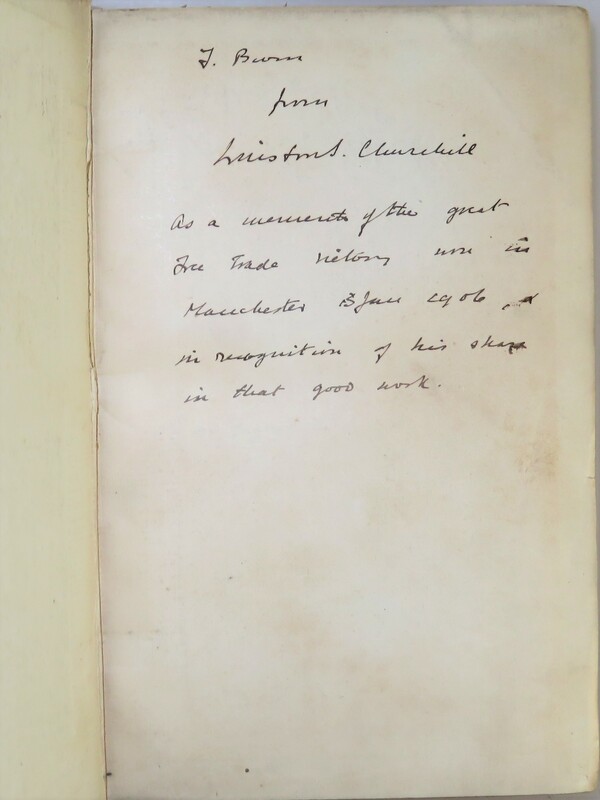 At 31 years old, “Churchill was now a Junior Minister in a Government furnished with far greater authority than it had expected.” Disraeli’s biographer wrote to congratulate Churchill “both on his book and the beginning of his official career”. Two years later, in 1908, Churchill would marry and be appointed to his first Cabinet post. As a powerful Liberal Cabinet Minister during the First World War, Churchill would experience a cycle of political ruin and rehabilitation echoing – and preparing him for – the ostracism of the 1930s that preceded his vindicated role as Prime Minister during the Second World War. Churchill would ultimately hold six different Cabinet posts under two Liberal prime ministers and would remain a Liberal until 1924, following the electoral destruction of the Liberal Party. All this was as yet unseen when he won his first seat as a Liberal in North-West Manchester on 13 January 1906. 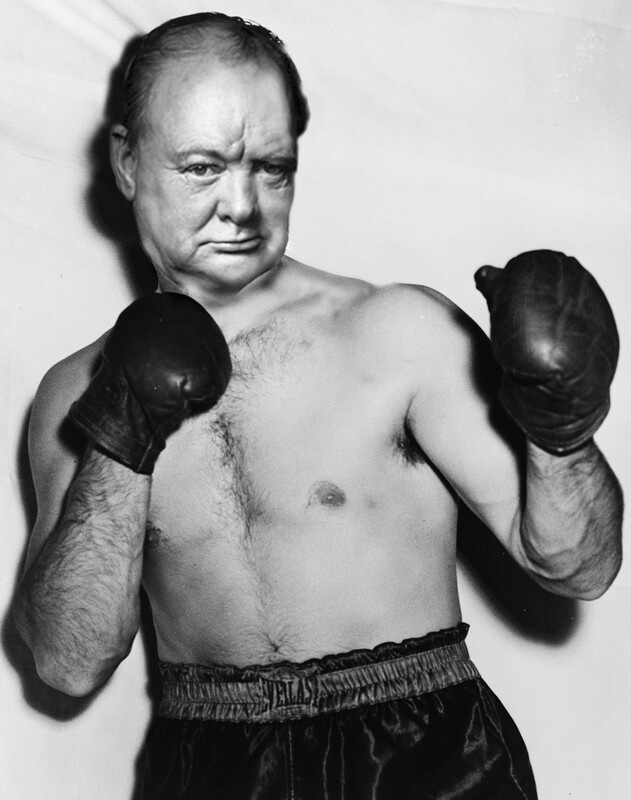 Nonetheless, we can reasonably speculate that the importance of the victory was not lost upon Churchill. 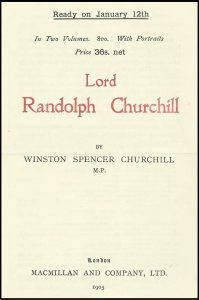 Churchill’s biography of his father had helped place Lord Randolph in historical context. We can also speculate that Churchill’s electoral victory as a Liberal in North-West Manchester helped Churchill put the specter of Lord Randolph’s failed political career behind him. 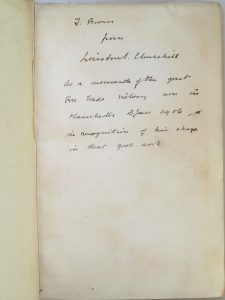 Perhaps all of this was in Churchill’s mind – or perhaps he was simply grateful – when he paused to warmly inscribe this first edition of his newly published book to the man who helped him achieve success. Irrespective, this presentation set testifies to the remarkable convergences of a pivotal moment in the life of both ascending Winstons – the literary and the political. This item – and dozens of other signed, inscribed, or handwritten treasures – will appear in our “Extra Ink” catalogue to be printed at the end of this year. Special thanks to our resourceful and indefatigable Churchill Book Collector colleague Elise, for much of the research for this post. A book can be a counterintuitive object. An array of tidy print between two covers neatly gilt-stamped with a proprietary author’s name belies the messy process of planning, writing, re-writing, emending, and further revising that actually makes any body of writing worth reading. Precious few authors accomplish the tasks alone. A veritable legion may be involved in publishing a book, including researchers, editors, agents, designers, lawyers, publishers, printers, and publicists. Moreover, the effort may continue long after initial publication. All of this is particularly true of a monumental work like Churchill’s The Second World War. 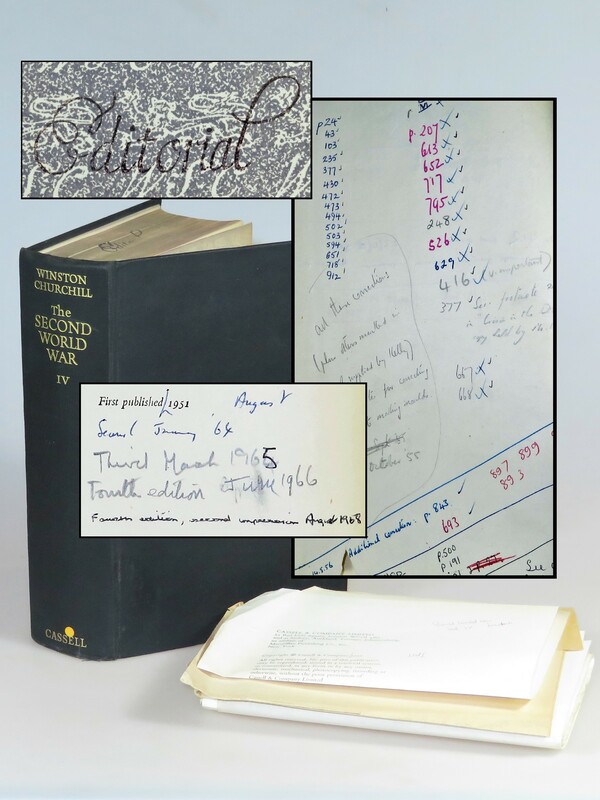 A recent find, a copy of The Hinge of Fate from the Cassell and Company archives, helps pulls back the curtain to reveal the ongoing time and labor that goes into publication. It also reveals a little-known story from Churchill’s second Premiership about a real-life Hemingway character who threatened to sue Churchill for libel. Cassell served as Churchill’s primary publisher for the final quarter century of his life, from 1941 on. As early as 1939 – before he was even Prime Minister – Churchill was courted by publishers for the enticingly lucrative rights to publish any post-war memoirs. When Newman Flower of Cassell secured publication rights to Churchill’s war memoirs, it was “perhaps the greatest coup of twentieth century publishing.” Churchill’s post-war literary output, particularly the six volumes of The Second World War, proved the essential asset to Cassell’s postwar recovery. Publication of the first volume, The Gathering Storm, was held up with constant corrections – despite which the first edition contained a number of errors. Among the most embarrassing was a description of the French Army as the “poop” rather than the “prop” of France (rendered doubly problematic by proximity to truth). 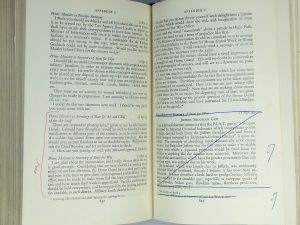 Although a capable team of proofreaders was engaged for the subsequent volumes, their efforts were not exhaustive, as evidenced by the number of corrections marked in this copy of the fourth volume. This volume, stamped “Editorial”on the front free endpaper and top edge, was a part of the Cassell and Company archives and features 55 handwritten emendations. 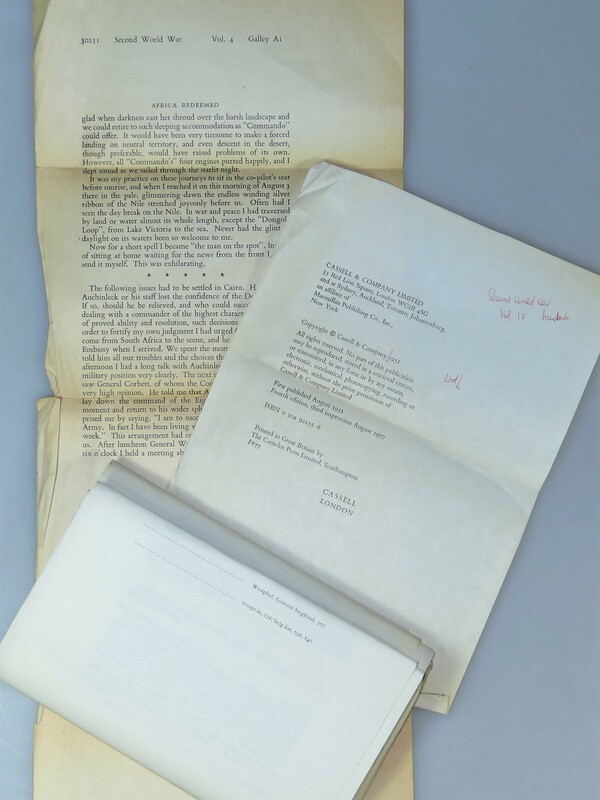 Accompanying the volume are 14 oversized, single sided galley sheets, as well as a loose copyright page with corrections for the “Fourth edition, third impression August 1977”. This copy of the first edition was used in Cassell’s editorial department until at least 25 May 1977. We have confirmed that handwritten corrections made within this particular volume were incorporated into later printings and editions. The edits range from simple corrections of letter cases to fixing misspellings to rewording sentences. One particular edit merits a highlight. 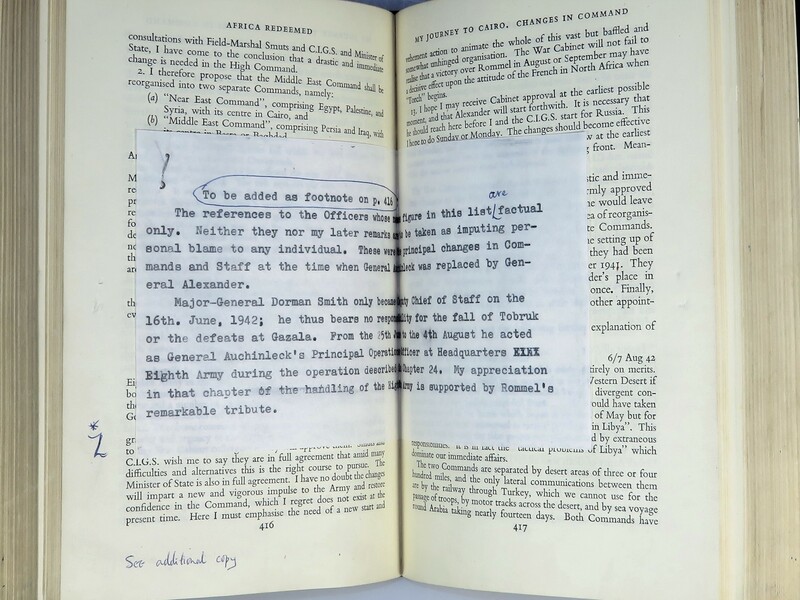 At page 416 a typewritten sheet is laid in bearing additional copy for a footnote added in later editions. The story of this footnote involves a Second World War General fired by Churchill. Eric Edward Dorman-Smith (1895-1969) served in the First World War with distinction, wounded three times and awarded the Military Cross for his efforts in the trenches of Ypres. Dorman-Smith was nicknamed “Chink” due to his resemblance to the Chinkara antelope mascot of his WWI regiment. On Armistice Day in Milan, Chink met Ernest Hemingway, who had been wounded on the Italian Front while serving with the Red Cross. Chink’s wartime heroics, coupled with his chivalrous demeanor and immaculately dressed image, encapsulated Hemingway’s conceptions of war and honor. 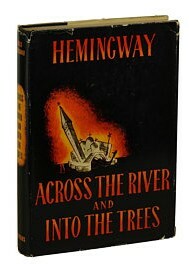 They became friends, and Hemingway would later use Chink as the basis for the character Colonel Richard Cantwell, the hero of Hemingway’s novel Across the River and Into the Trees. After the war Chink split the 1920s between Paris – where Hemingway introduced him to James Joyce, Gertrude Stein, and the rest of the city’s literary intelligentsia – and instructing at Sandhurst and Staff College Camberley. At Camberley, Chink scored 1000 out of 1000 on his tactics entrance paper, a record. At the onset of the Second World War, he was positioned as the director of military training in India and was soon transferred to the Middle East Staff College in Haifa. Despite a position that he derided as a “schoolmaster’s role”, Chink’s tactical advice played a key role in Italy’s defeat at Beda Fomm. 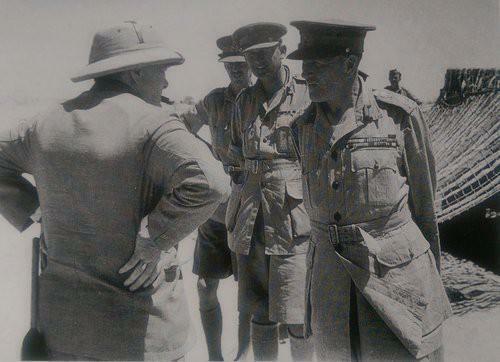 1942 Auchinleck assumed command of the Eighth Army, and Dorman-Smith was promoted to acting major-general. He would hold the position for only three months. In August 1942 Winston Churchill ordered the “Cairo purge” – a complete restructuring of the Middle East command. 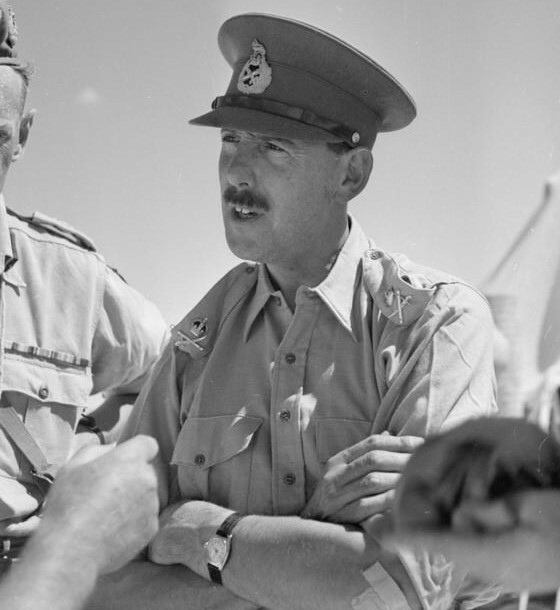 Montgomery replaced Auchinleck and Dorman-Smith was given command of a brigade in Italy before being dismissed and involuntarily retiring in 1944. Disgraced and disillusioned, Dorman-Smith returned to his home in Ireland and changed his name to “O’Gowan”. He would implausibly transition from British General to Irish nationalist and IRA supporter. O’Gowan né Dorman-Smith apparently employed his lawyers “all over the place, sent out for everything from slight disappointments in newspaper articles, to local affairs, such as destruction of heritage sites and water pollution in Cootehill.” Nonetheless, Churchill was advised by Sir Hartley Shawcross (the lead British prosecutor at the Nuremberg War Crimes Tribunal) that the cited passages could plausibly be read as defamatory. Defending a libel case might require making sensitive documents public. Shawcross arranged for Alanbrooke and Montgomery to testify against O’Gowan. The need never manifested; the trial never went to court. In early 1954, O’Gowan suddenly backed down from his demands. O’Gowan’s biographer claimed Churchill’s advisor called on O’Gowan’s sense of chivalry by informing him of the Prime Minister’s stroke in 1953 and warning that the affair may cause a second, fatal stroke. 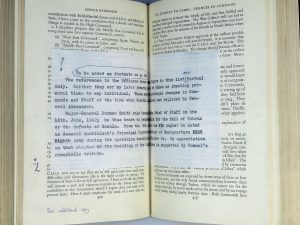 The matter was settled by the inclusion of a footnote in future editions of the book – the typed manuscript of which is laid in this volume. This unique copy of The Hinge of Fate may be viewed HERE.